Following a dramatic penalty shot win over the Guildford Flames Slough Jets set off early to face the Peterborough Phantoms on their home ice. The home team dominated the shot count in the first period with Andrej Vasiljevic making 21 saves in the opening frame while Damien King saved his 5 shots equally. As the home team continued to test the Slough netminder it was against the run of play that Marcel Petran scored the game’s first goal, shorthanded while a too many men penalty was being served. The remaining 4.12 passed by in the period with no further scoring to leave the scoreboard showing 1-0 after the first two periods. The effects of five tough periods plus overtime and penalties so far in the weekend showed on the visitors in the final period as the home team capitalised on their 40 minute mark lead. Will Weldon made it 2-0 at 46.47, followed by Luke Ferrara just 13 seconds later for 3-0. Weldon’s second at 51.15 was trailed by Darius Pliskauskas making it 5-0 at 51.54. With 3.34 left to play a powerplay goal from Luke Ferrara concluded the scoring at 6-0. Telford opened the scoring at 9.18 with Tim Burrows finishing from Scott McKenzie and Tomas Karpov but Slava Koulikov pulled his team level at 12.30 and despite a total of 23 shots on goal in the period there was just those two goals meaning a 1-1 scoreline after 20 minutes. The second period saw Slough take the lead thanks to Koulikov’s second of the night at 27.40 and Frantisek Bakrlik scored shorthanded at 29.48 for 1-3. Not to be out done Telford made the game level with Callum Bowley scoring at 35.31 and Karpov scoring 24 seconds later. The final 4.05 of the middle period saw no more scoring so the second period ended tied at 3-3. The first 10 minutes of the third period passed by scoreless but at 52.46 Bakrlik finished from Mindy Kieras and man of the match Ciaran Long for the game winning goal. Both netminders closed out the remainder with no further scoring and Slough took the two points. After a win over ninth placed Peterborough on Saturday Slough Jets faced the journey to Telford to face the tenth placed Tigers in their rink. Slough took just 1.30 to get into a lead they would never lose as Ryan Watt scored by Declan Ryan in net for the visitors. While Gregg Rockman was the busier of the two netminders, facing nearly double the shots of his opposite number Adam Calder netted the second Slough goal with just 18 seconds left in the first period making it 2 goals from 8 shots. The second period saw the teams share the honours as Watt netted his second at 32.49, not long after his team had killed the game’s first penalty. Thomas Sore made it 1-3 at 35.32 and while the home team again enjoyed a sizeable shot advantage the period ended with just a single goal each. The first half of the third period passed by scoreless before Watt completed his hat-trick at 51.51 making it 1-4. Dan Davies found the back of the net for the visitors 5th goal at 52.42 and Ryan Bainborough came on in replacement of Rockman for his first EPIHL minutes of the season completing the game with a clean sheet. Slough Jets returned home to host the Swindon Wildcats following an impressive seven goal shut-out the previous night. Slough picked up where they left off the previous night with Darius Pliskauskas netting the opening goal at 3.44. 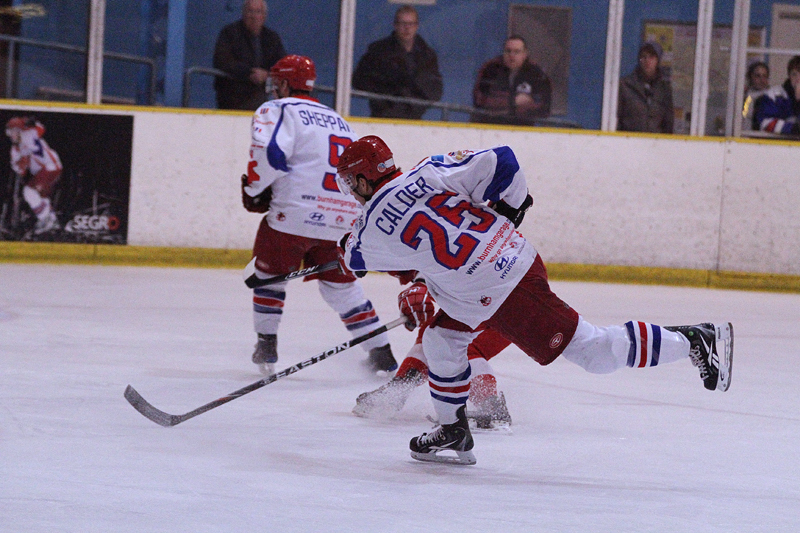 Doug Sheppard netted at 6.07 and Adam Calder made it 3-0 at 9.52 before the visitors called their time-out. Jonas Hoog pulled a goal back for Swindon at 11.15 but Slough ended the period at 3-1. The teams costed through the middle period until the home team time-out at 32.43 and Ryan Watt added the fourth goal at 34.38, quickly followed by Joe Greener making it 5-1 at 36.15. Slough got the better start in the third period with Slava Koulikov scoring at 41.14 but two late powerplay goals allowed Swindon to add to their score with Baird scoring at 55.21 and 58.35. Guildford entertained Slough to start off a mini series comprising four games split between league and cup in an eleven day period. Slough’s Captain Blaz Emersic took the game by the scruff of the neck in the first period with a straight hat-trick. He opened the scoring at 5.28, netted his second at 11.04 and completed the hat-trick at 16.22 to finish and 0-3 period. Both netimders dealt with their combined 22 shots through the middle period to leave the score at 0-3 after 40 minutes. Paul Dixon netted Guildford’s only goal at 43.40 while Guildford dominated the shooting 14-2 but Peter Poljacek scored on the powerplay at 49.31 to make it 1-4 which ended as the final score.